Rest of India paid the penalty for lack of application as they conceded a 95-run first innings lead to Mumbai in the Irani Cup cricket match at the MA Chidambaram Stadium here today. Olympic associations of India and Pakistan have decided to resume sports ties, including hockey, between the two nations, which had been snapped many years back, according to the secretary-general of the Indian Olympic Association Mr Randhir Singh. 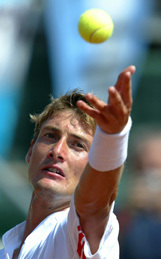 Spain’s Juan Carlos Ferrero serves to Argentina’s Gaston Gaudio in their Davis Cup semifinal match in Malaga on Friday. Ferrero won in straight sets 6-4, 6-0, 6-0. The Cricket Club of India has conferred life membership on International Cricket Council President Ehsan Mani of Pakistan and ICC CEO Malcolm Speed. Mani is in Mumbai in connection with the ICC’s cricket committee meeting. Brian Lara holds many sparkling gems on his crown. He’s famous for his moods and tantrums, too. But the Brian Lara who breezed past Delhi today projected a different image — that of a sober, softer man who lent a willing ear to all the probing questions put at him and replied with candour and modesty. 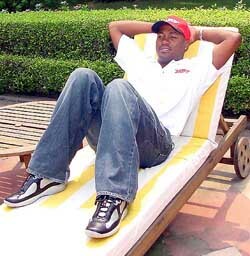 West Indies cricket captain Brian Lara in a relaxed mood on a fleeting visit to New Delhi on Friday. Himachal Pradesh Cricket Association beat Piccadily Cricket Club, Chandigarh, a last minute entry into the tournament, by 19 runs in a closely fought match in the 10th All-India JP Atray Cricket Tournament at the PCA Stadium, Mohali, today. Martin Verkerk won a titanic five-setter against Rohan Bopanna, needing 22 games to win the final set and give the Netherlands a 1-0 lead over India in their Davis Cup world group playoff tie. Title contenders India, led by ace forward Dhanraj Pillay, arrived here with an express directive from their hockey federation to keep media at bay and “concentrate on the game”. Karandip Singh Sandhu of Chandigarh will be hoping for a strong showing at the Power M1 Challenge Rally as the competitive legs begin here tomorrow. 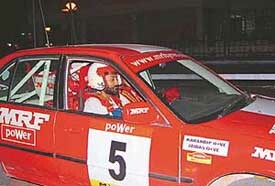 This rally is the fourth round of the Indian National Rally Championship held by the Motorsports Association of India. Ajeetesh Sandhu played a one over card of 73 to tighten his grip on the title after the third day's play in the Chandigarh Junior/ Subjunior Golf Championship here today. The Logo of the 19th Haryana State Games, 2003 was released today by Mr Abhey Singh Chautala, President of the Haryana Olympic Association. Mandeep Kaur of Ludhiana has made the nation proud by securing 2nd position and winning 3 silver medals in the 21st World Juniors Powerlifting Championships held in Poland. After wrapping up Mumbai’s last wicket and restricting the Ranji Trophy champions led by star batsman Sachin Tendulkar to a modest 297, Rest saw their top order batsmen commit a harakiri and be bowled out for 202 in the first innings. At stumps on second day, Mumbai were 11 for no loss — a lead of 106 runs — with Vinayak Mane (6) and Wasim Jaffer (1) at the crease. The might of Tendulkar notwithstanding, Rest are the favourites to win the trophy based on their superior batting and bowling line-up. But the Rest batsmen lost their wickets due to poor application on a wicket that offered turn and bounce, and was double paced. With Mumbai Cricket Association president Sharad Pawar and cricket board’s TRDO chairman Dilip Vengsarkar witnessing the match, Mumbai bowlers were up to the task. Off spinner Ramesh Powar looked more impressive than the duo of Anil Kumble and Harbhajan Singh, who went wicketless in Mumbai’s first innings. The blame for Rest’s debacle lay on their batsmen. Their captain Saurav Ganguly proved that he is still to shed the outside the off stump trap as he played Powar away from his body, giving a simple catch to Nishit Shetty at second slip. Mumbai (1st innings): V. Mane c Kumble b Bangar 26, W. Jaffer b Balaji 43, N. Shetty c Shewag b Zaheer 5, S. Tendulkar c Dravid b Zaheer 94, V. Kambli lbw b Zaheer 2, A. Agarkar c Patel b Zaheer 0, S. Bahutule c Laxman b Kumble 58, R. Morris c Harbhajan b Balaji 31, R. Pawar b Kumble 0, V. Sawant lbw b Zaheer 4, A. Salve not out 2. Extras: (b-16, lb-3, nb-13) 32 Total: (all out in 97.2 overs) 297 Fall of Wickets: 1/32, 2/59, 3/91, 4/98, 5/98, 6/247, 7/260, 8/260/ 9/265. Bowling: Zaheer 24-6-77-5; Balaji 20.2-6-47-2; Bangar 10-2-35-1; Ganguly 9-5-11-0; Kumble 22-6-64-2; Harbhajan 12-2-44-0. S. Bangar c Mane b Morris 29, V. Shewag b Salvi 16, R. Dravid c Tendulkar b Powar 41, V.V.S. Laxman c Powar b Agarkar 5, S. Ganguly c Shetty b Powar 0, Yuvraj Singh c Jaffer b Powar 27, P. Patel c Samant b Salvi 26, A. Kumble LBW b Agarkar 1, Harbhajan Singh LBW b Powar 4, Zaheer Khan c Shetty b Bahutule 34, L. Balaji not out 12. Extras: (b-2, nb-2, w-3) 7. Total: (all out in 73.2 overs) 202 Fall of wickets: 1/16, 2/87, 3/89, 4/90, 5/123, 6/125, 7/134, 8/141; 9/159. Bowling: Ajit Agarkar 18-7-29-2; Avishkar Salvi 13-3-52-2; Sairaj Bahatule 9.2-1-35-1; Robin Morris 10-2-23-1; Ramesh Pawar 23-6-61-4. Mr Randhir Singh, along with two other members, Mr Mohamad Aslam Khan, and Mr B.S. Ojha, returned from Pakistan here today after holding a comprehensive dialogue with their Pakistani counterparts at Islamabad. Briefing newsmen, Mr Randhir Singh said though Pakistan had decided to back India’s claim for hosting 2016 Olympics jointly, rules of the International Olympic Committee do not permit such an arrangement. The secretary-general said Asian countries must come together to convince the international body to allow India to host the 2016 Olympics. He said Pakistan had confirmed their participation in the Afro-Asian Games to be held in Hyderabad on October 24. Reciprocating their goodwill gesture India had confirmed participation in the South Asian Federation (SAF) Games. He said it was after a gap of three years that the SAF games would be held in Pakistan from March 29 to April 7 next year. He said Pakistan had shown keen interest in organising regional level meets and suggested that teams from Indian state of Punjab and Pakistan’s Punjab province should take a lead by sending teams for encouraging sports in this area. He said Pakistan had desired to resume hockey ties with India. The Cricket Club of India has conferred life membership on International Cricket Council President Ehsan Mani of Pakistan and ICC CEO Malcolm Speed. Mani is in Mumbai in connection with the ICC’s cricket committee meeting. Mani was conferred the honour by Mumbai Cricket Association (MCA) President and Nationalist Congress Party chief Sharad Pawar. Malcolm Speed was conferred the life membership by former India captian Nari Contractor. Former Indian Test players, Madhav Apte and Madhav Mantri, were also conferred life membership. The dignitaries who attended the function, apart from the delegates from the 10 Test playing countries and three non-Test playing nations, included former Indian skippers Sunil Gavaskar, Dilip Vengsarkar, cricket board (BCCI) President, Jagmohan Dalmiya, and secretary, S.K. Nair. The two-day meet of the ICC’s cricket committee — management (CC-M) has important items on the agenda like the ICC Champions Trophy in England in September 2004; ICC U/19 World Cup in Bangladesh in February and March 2004, suspect bowling actions process; performance analysis of match officials and player associations. According to UNI in a significant move, the ICC today turned down suggestion to prune the number of participating teams in the World Cup and instead raised the limit to 16 teams for the next edition of the cup to be held in West Indies in 2007. The West Indies captain, who came to Delhi on a brief promotional tour for MRF, made an honest appraisal of another cricket ‘‘legend’’, Sachin Tendulkar, and conceded that the Indian star was a cut above him. ‘‘Sachin is phenomenal’’, Lara said, though he did not try to hide his own importance among the pantheon of cricketing greats, adding that “we are the top two (batsmen, obviously!)”. Lara has high opinion about the Indian team as a whole “as the Indian team is much matured, now that they have crossed the bridge at the ICC Trophy”. He said the Indians were really good playing on home ground, but “met with a kind of psychological disadvantage”, while playing away from home. Lara conceded that though Indian cricket was rich in many respects, it was a different experience “playing in front of 80,000 fans in Melbourne, with everyone rooting for Australia. There you don’t see the money, you don’t see the fans, only the harsh reality of the match and in such conditions the Indians have been found wanting”. Lara, who sees a resurgence of West Indies cricket after languishing in the doghouse for a quite some time, particularly after the series against Australia and Sri Lanka, was optimistic about his team’s prospects in the upcoming series against South Africa, whom he described as the “second best Test-playing country” in the world. Lara said his knock of 153 against Australia at Barbados in 1999 was his “best” and Wasim Akram of Pakistan was the “best” fast bowler he had ever played against. Lara said his own batting was a “lot better now”, and the West Indies team were on the upswing. Lara had high praise for India’s very own Javagal Srinath “who has served the country for very long and admirably”, and added that players like Zaheer Khan and Ashish Nehra were also talented bowlers. Lara, however, admitted that India were yet to produce fast bowlers of the calibre of Brett Lee (Australia) and Shane Bond (New Zealand), despite all its efforts to shape up genuine fast bowlers. “But Srinath has been very loyal, and India have a pretty good side”, he remarked. 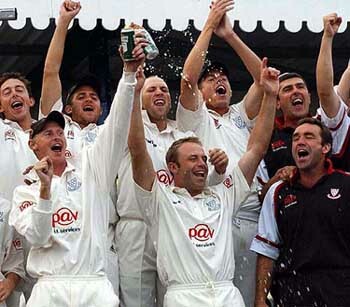 Lara said that it was unfair to make comparisons, say for example, between Walsh and Ambrose “as every one has his own image, his own individual character”. Lara also took the stand that “sledging” was part of cricket “as it has been there for a long time”. But he noted that he did not carry forward the on-field happening off it to nurse any ill feeling. Lara, who along with Sachin Tendulkar, have been netted by MRF, plans to visit India “as often as I can”, on business trips. Piccadily XI skipper Arun Tuli won the toss and elected to field. His move paid rich dividends when they curtailed Himachal Pradesh Cricket Association to a modest total of 165 in 50 overs. The Himachal innings was propped up by their skipper Vikram Rathore (23), Richi Kapoor(27), Vishal Bhatia (24) and Vinod Minhas (21). For Piccadily Club Sanjay Gill (2 for 42) and T Anand (2 for 29) were the main wicket-takers. Chasing a none to difficult target, Piccadily Cricket Club folded for 147 runs in 46 overs. Their skipper Arun Tuli was the highest scorer with a well made 37. Tuli was tragically run out when he was taking his team close to the victory target. For his valiant effort of 37 runs and one wicket for 17 runs he was declared man of the match. For Himachal Kapoor Singh (3 for 32) and Nischil Gaud(2 for 28) were the main wicket-takers. Brief scores: Himachal 165 all out in 46 overs (Richi Kapoor 27, Vikram Rathore 23, Vishal Bhatia 24, Vinod Minhas 21, Sanjay Gill 2/42, T. Anand 2/29). Piccadily XI 147 all out in 46 overs (Arun Tuli 37, Rahul Arora 20, Shashi Ranjan 19, Kapoor Singh 3/32, Nischil 2/28). In the second match of the day played at the cricket stadium in Sector 3, Panchkula, between Associate Banks, Mumbai, and Bihar Cricket Association, the bankmen coasted to a huge 85-run win which fetched them an additional bonus point. Associate banks after winning the toss and electing to bat were all out for 198 in 49.2 overs. C.P. Sahu 34 off 40 balls and Anil Sinha 31 off 39 balls were associated in a second-wicket partnership of 56 runs. Their innings were propped up by some lusty hitting by M. Matithia, who scored an unbeaten 29, inclusive of two fours and a towering six. Sanjay Gupta (3 for 38), Sumit Panda (2 for 32) and Anshuman Raj (2 for 21) were the main wicket-takers for Bihar. Replying to the Associated Banks’ total Bihar were bundled out for 113 runs in 41.3 overs. There rout was plotted by left-arm spinner Anand Kati who returned an impressive figure of 4 for 20 in eight overs and was ably supported by right-arm medium pacer Davinder Bundela who got two for 15 runs. The only resistance came from C.M. Jha, who scored a polished 34. Brief scores: Associated Banks 198 all out in 34 (Anil Sinha 31, M. Matithia 29 not out, Sanjay Gupta 3/38, Sumit Panda 2/32, Anshuman Rai 2/21). Bihar 113 all out in 41.3 overs (C.M. Jha 34, Nikhlesh 17, Anand Kati 4/20, Davinder Bundela 2/15). Saturday’s fixtures: Rajasthan vs Indian Oil Corporation at PCA Stadium, Mohali, 9 a.m.; PCC vs Associated Banks at Sector 16 stadium, Chandigarh, 9 a.m. and PCA Colts vs Piccadily XI at Dhruv Pandove Stadium, Patiala, 9 a.m.
Verkerk, his legs cramping and his hands shaking from fatigue by the end of a grueling 4:35 hours, won 5-7, 6-3, 5-7, 7-6 (9), 12-10. Bopanna effectively found the corners and the lines throughout much of the match, but Verkerk overpowered the 344-ranked Indian with his powerful backhand and serving. In the second singles, veteran Dutchman Sjeng Schalken defeated rookie Prakash Armritraj 6-3, 6-1, 6-1. 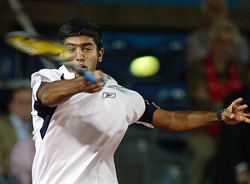 On Saturday, Verkerk and John van Lottum were up against Bopanna and doubles specialist Mahesh Bhupathi. At 11-10 in the last set, Bopanna went down two match points when his forehand missed the line by a hair. He fought back with a service winner, but lost the match with a chip-and-charge shot that went long. Verkerk, a surprise finalist at this year’s French Open, hammered 43 aces against Bopanna’s 20. Double faults were more even at 13 for the Indian and 12 for the Dutchman. But Verkerk’s came at strategic times. He double faulted to hand Bopanna a service break at 6-5, allowing the Indian to serve out the first set. The 6th edition of the Cup begins here from Sunday and India will try to capture it which has so far eluded them. The title winners here will qualify for the 2006 World Cup. The Indian players were barred from speaking to media while they where undergoing a trial camp in New Delhi and that ban still continues. “It is high time we produce results and then the players will have ample chance to talk to media” said coach Rajinder Singh. The Indian media had held Rajinder Singh responsible for the “media shut out” during the camp and the coach is not apologetic about it. “All the the players have been specifically told not to talk to the Press,” Rajinder said adding” The tournament (Asia Cup) is very important for us and we want all the players to be focused”. “It is not as players will not be allowed to talk to the Press but let us first settle down, get out act together and then we will see” the coach said. “We have been runners up in first four editions and finished third in the last edition which was also held here, I want that this time India should win, victory here will save us from a hassle of going through the World Cup qualifiers” he said. Rajinder said that he was confident that team will make it to the semi-finals. According to the Indian coach, Pakistan, South Korea and host Malaysia are the teams are in the running for the title. Soon after their arrival here the Indians had a strenuous work out workout yesterday evening. India are in group B with Pakistan, Bangladesh and China and all their matches will be played at night. They open their campaign against China on Sunday followed by league matches against Bangladesh, and Pakistan. Four teams in this tournament, India, Pakistan, Malaysia and Japan will again figure in the 12-team Olympic qualifiers to be held in Madrid from March 2 to 13. It will be a good opportunity for Karandip to win on home ground and try to catch up with the current leader Naren Kumar. Karandip is second in the overall championship standings with 26 points while Naren is way ahead with 46 points. Team MRF continues to maintain its supremacy as its members taking up the top four spots. Apart from Naren Kumar and Karandip Sandhu, Team MRF includes No 3 in the overall standings, Arjun Balu (19 points), No 4 Narayanaswamy Leelakrishanan (17 points) and Vikram Mathias. All the Team MRF members will be driving Honda CIty V-Tec cars. Naren Kumar has won all the three earlier stages at Chikmagalur, Nashik and Kochi and will try to keep his slate clean here too. He said he was happy to be back in Chandigarh after a gap of seven years and was looking forward to driving tomorrow.” The stages are pretty much the same. The first stage is fine, the second is a bit rough and the third has quite a steep climb,” said his navigator V Ram. Naren said at the Press conference today, “the rain has effected the route. There are a few rough patches. The first stage is fast while the second is rougher. Overall it will be a good rally.” Winning may not be a problem for him as he had won earlier here. Karandip, meanwhile refused to acknowledge that he had any advantage of home ground, saying it was his first time there. “There is an equal chance for everyone. I just hope to do well and praying that I don’t get any punctures here. In Nashik I had four punctures in six stages, so I am hoping for a run of good luck here.” Karandip has had a few good moments, finishing second in Chikmagalur and Kochi. It hasn’t been a great rally for seven-time national champion N. Leelakrishan this year and he said he was basically looking for a decent showing. He is likely to retire from rallying at the end of this season. The rally will cover 102.4 km in 12 special stages while the total distance covered will be 577.29 km. Sixteen entries were cleared for the ceremonial flag-off today after scrutiny. In the 801-1400cc class Lohith V Urs leads with 29 points while Rahul Kantharaj of Team Movva is not far behind with 27 points. Giving them stiff competition will be the team of former champion driver Sameer Thapar and Gurvinder Singh Mann. Ajeetesh had a three-day tally of 223 with Gaganjeet Bhullar four strokes behind with a tally of 227. Jaskeerat Dullat who played a card of 79 was at third spot with a tally of 232. In category ‘B’ also Ajeetesh Sandhu led the field. Fatehbir S. Dhaliwal with today’s score of 76 was placed 2nd. Raghav Wahi went ahead of Viraj Gadhoke and was placed third with today's score of 79, one stroke ahead of Viraj Gadhoke. In ‘C’ category Kanishk Madaan was overtaken by local lad Rahul Bakshi. Rahul Bakshi with a round of 80 went ahead of Kanishk Madaan, who today played 86. Madhav Soi with a round of 85, still held on to his third spot. In ‘D’ Category Viraat Badhwar played a round of 82 to hold on to his first position. He was followed by Raghav Bhandhari with today's round of 89. Ankur Chadha with a round of 94 was at the third spot. Category-A: Ajeetesh Sandhu (CGC) 76+74+73=223, Gaganjeet Bhullar (RCF, Kapurthala) 76+77++74=227, Jaskirat Dullat (BEGC, Patiala) 75+78+79=232, Himmat Rai (DGC) 77+81+75=233, Aditya Singh (DGC) 81+74+78=233. Category-B: Ajeetesh Sandhu (CGC) 76+74+73=223, Fatehbir S. Dhaliwal (CGC) 76+78+76= 230, Raghav Wahi (BSF, Jammu) 81+80+79=240, Viraj Gadhoke (DGC) 81+80+80=241, Sidharth Seth (DGC) 81+81+82=244. Category-C: Rahul Bakshi (CGC) 81+83+80=244, Kanishk Madaan (DGC) 81+81+86= 248, Madhav Soi (DGC) 84+84+85=253, Amanvir Guron (CGC) 86+92+92=270, Mohd Asif (AGC, Meerut) 92+94+92=278. Category-D: Viraat Badhwar (DGC) 86+82=168, Raghav Bhandari (CGC) 92+89=181, Ankur Chadha (AGC,Delhi) 97+94=191, Hemendra Chouwhary (RGC, Jaipur) 99+98=197, Tarundeep S. Chadha (CGC) 108+101=209. The logo of the games depicts the face of lion which is a symbol of power and energy. He disclosed that all preparations for the forthcoming State Games, scheduled to be held at Yamunanagar from October 16 to 19 had been made. Entries had been received from all the district Olympic associations and affiliated units/boards of the Haryana Olympic Association. The competitions will be held in athletics, wrestling, judo, boxing, kho-kho, kabaddi (both national and circle style), hockey, weightlifting, boxing, volleyball, basketball, handball, fencing, gymnastic, table tennis, lawn tennis, shooting, swimming, triathlon and cycling. The Haryana Olympic Association expects around 4000 sportspersons to show their prowess in these games. PAP Jalandhar and Bathinda in the men's section and Ludhiana and Faridkot in the women's section won their semifinal encounters to set up the title clash on the penultimate day of the first Parminder Yadgari State-Level Invitation Basketball Championship being held at Malout. Uzbekistan stormed into the final drubbing India TFA White by a brace in the four-nation JRD Tata Cup International Invitational Football Tournament (U-19) at the JRD Tata Sports Complex here today. “Diet money for sportspersons will be increased and a new pension scheme for sportspersons will be introduced soon,” said Minister of State for Sports Jagmohan Singh Kang. He said this while inaugurating the 26th Junior National Archery Championship here today.